Here is a list of useful medicine and dressings with a description of their uses. 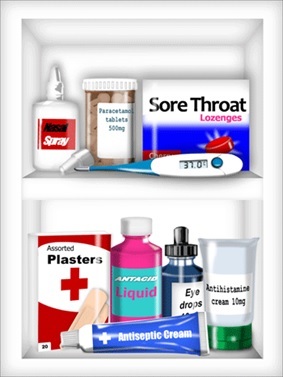 All are quite cheap and worth stocking at home in readiness for minor illness. For adults, good for headaches, colds, sore throats and painful bruises. Add to hot water to make steam inhalation for treating catarrh and dry or painful coughs. For dabbing (not rubbing) on insect bites and strings and sunburn. Remember that your local chemist can give advice about medicine.